Ace Storage is a leading Cleveland-area provider of clean, safe, and affordable self storage units. 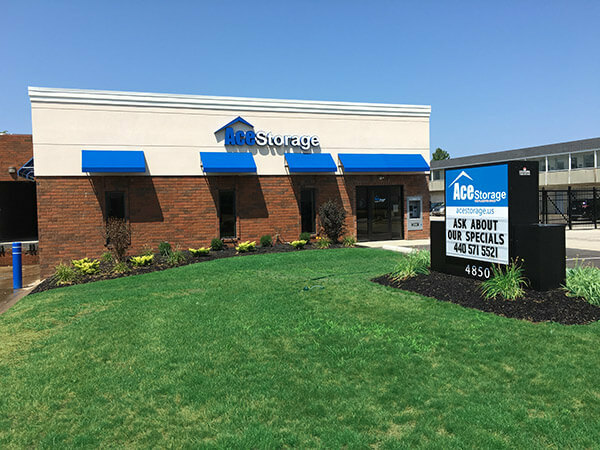 Locally owned and operated, we are committed to being the most convenient, secure and professional self storage solution in the Willoughby, Ohio area. Our storage units provide free 24-hour access, resident on-site managers, and drive-up for easy access to each unit. We can also store your boat, trailer or RV. More sizes - including climate controlled units - available now! At Ace Storage, we want to make your rental experience as satisfying as possible. That’s why we offer a variety of unit sizes, including climate controlled options. We also provide a full line of moving and packing supplies, the convenience of U-Haul vehicle rentals, and renter’s insurance, if needed. Count on us for helpful advice on selecting the right unit size, as well as moving supplies. We’ll offer you a clean, ready-to- rent storage unit, and our commitment to keeping your stored belongings safe and secure, at all times. Coming soon for Ace Storage: a complete cosmetic restoration, the addition of individual alarms and gated access, additional lighting and comprehensive surveillance videos! We'll match the price of any other advertised storage facility! Our full range of supplies from bubble wrap to blankets and boxes. Haul it all with U-Haul. Keep your recreational investments secure and out of the way.